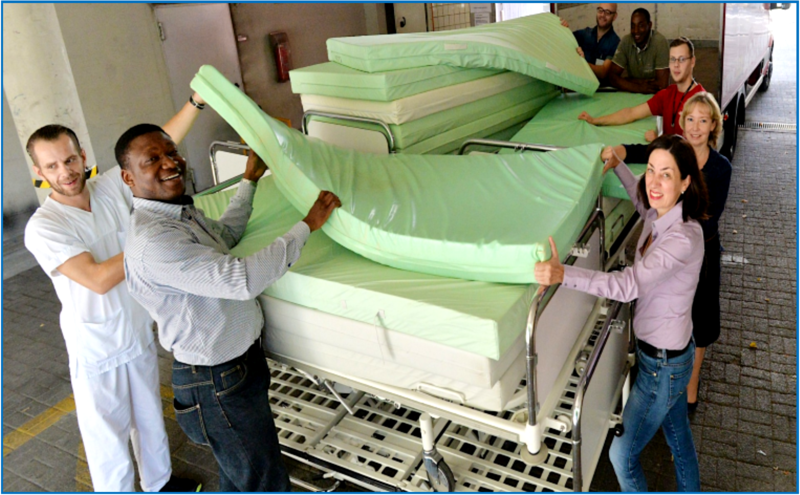 Nurses and Doctors Loading Hospital Beds at Martin Luther Hospital in Berlin, Germany[/caption]In a well-attended presentation ceremony at Duawoh Street in Kenema, YAD and Fambul Tik e.V. triggered yesterday, 30th October 2014, smiles and laughter in the face of hospital staff of Kenema government hospital, Paramount Chiefs of Malegohun and Niawa Chiefdoms and local authorities of Kenema city as they receive the most needed medical donations at this trial time in the Sierra Leonean calendar. The donation included 35 hospital beds, mattresses, stretchers, wheelchairs, hospital cupboards, ex-ray extractors, hand gloves, facial masks, protective gowns, disinfectants, hand gloves and assorted medical supplies. Presenting the items, the Programme Coordinate, Othman Sheriff, disclosed that the items were donated by various philanthropists in the Federal Republic of Germany prominent among which are the Martin Luther Krankenhaus – Berlin, Jüdisches Krankenhaus – Berlin, Ev. Amalie Sieveking-Krankenhaus gemeinnützige GmbH – Hamburg, Katholisches Kinderkrankenhaus WILHELMSTIFT gGmbH Hamburg, and Krankenhaus Hedwigshöhe Berlin. And internal transportation and shipment was coordinated and co-financed by Fambul Tik e.V., Kanzlei Ute Sheriff and the German Federal Ministry of Development and Economic Cooperation (BMZ). “As we all know”, Sheriff went further, “the Ebola virus has and still is claiming countless number of innocent citizens; it has broken our socio-cultural and religious fundaments as we witness relatives being unwillingly quarantined from their beloved families; deceased parents, brothers, sisters, colleagues and neighbors being buried without our usual traditional, cultural and religious rites; and the survivors are now living with constant social stigma. Many children and mothers are being left without breadwinners thereby adding more sores to their protracted wounds of poverty. The future is falling apart; educational institutions have been closed indefinitely; costs of essential commodities and services have been skyrocketed; social and economic activities are halted and every inhabitant of this region is now living in despair and agony wondering when, who and where the dreadful virus shall strike next”. “We the youths of Kenema, under the umbrella of YAD and Fambul Tik e.V., cannot continue to be sitting down and be watchful while our future is being jeopardized. Today’s occasion therefore, marks our continuing participation in the war against the Ebola virus and other preventable diseases that are claiming innocent lives in our beloved district”, he affirmed. In his response, Mr. Joseph Kamara who represented the Kenema government hospital and the District Medical Officer, stated that the items have arrived at the right time. “You may have no idea how many beds and mattresses we have already burnt down as a result of Ebola”. We are forced to burn down every material used in the Ebola treatment center in order to prevent further spread of the disease into the community. The items donated to us by YAD and Fambul Tik e.V. have therefore arrived at the right time because since the epicenter was relocated to the outskirt of the city, we have been in the process of re-equipping the hospital again “Mr. Kamara disclosed. On behalf of the District Medical Officer and staff of Kenema government hospital, Mr. Kamara extended sincere thanks and appreciation to the philanthropists in Germany who donated the items and all and sundries who contributed to its safe delivery in Sierra Leone. One of the beds which has an in-built electronic remote control system and which Mr. Kamara referred to as a “new technology” ever witnessed in his professional life, was demonstrated in front of the viewers. The Senior District Officer (SDO) Kenema district, Mr. Abdulai Mansaray, thanked YAD and Fambul Tik for the gesture and also asked other youth organizations in the country to follow the footsteps of YAD. “Bravo to the youths of YAD!” he expressed. “This is the type of youth organizations we are yearning for in this district and I hereby request every youth in Kenema to follow shoot”. Speaking on behalf of the Beneficiary groups in Malegohun chiefdom, the Paramount Chief, Madam Salay Satta Gendemeh expressed profound thanks and appreciation to the staff and Management of YAD and Fambul Tik for the gesture. “Since our health centers were established, our lactating mothers and pregnant women have been sleeping on poorly constructed wooden beds, some without even a mattress” she stated. “We are therefore proud today of a son of the soil like Othman Sheriff who has risked his life to rescue us during this very difficult time in our history”. On behalf of the Niawa chiefdom community, Sheik Konneh and Sheikh Alhaji Andulrahman Turay who represented Madam PC Mariama Jaward Tamia, expressed profound gratitude and appreciation for the gesture and further invoked blessings for the donators. Regarding the development efforts of the two organizations, Sheriff disclosed that they have claimed a tremendous success in this year. “I would like to take this opportunity, on behalf of the board and management of YAD and Fambul Tik e.V, to formally inform you that our headquarters which was previously situated at No. 7 Kobba Street, has now been relocated to No. 14 Duawo Street here in Kenema. 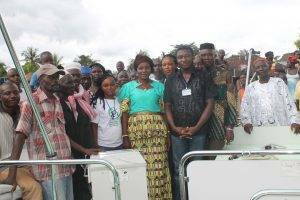 This became necessary after the two organizations decided to expand their activities to benefit a wider range of beneficiary groups, regardless the Ebola outbreak” he revealed. “The new office”, he explained further, “entails 9 rooms, 4 toilettes, a large pallor, a clean water-well and concrete security fence. It’s intended to house a digital library, Information and Communication Technology (ICT) training institute, desktop publishing centre, digital photo lab and a youth consultation desk purposely dedicated to our affiliated youth groups, namely: The Gbo-kakajama Youth in Action for Progress, Nyandeyama Youth in Action for Development and Action Star Youth Club. You shall be soon invited to an official opening ceremony of the new premises in due course”, he concluded. The occasion ended by an inspection tour of the premises followed by a vote of thanks given by Melvin Kanneh of Nyandeyama Youth in Action for Development.